New York Times bestseller! Sara Holland is a fierce storyteller. Everless gives new and terrifying meaning to the phrase running out of time. --Stephanie Garber, New York Times bestselling author of Caraval In the kingdom of Sempera, time is currency--extracted from blood, bound ... read full description below. New York Times bestseller! Sara Holland is a fierce storyteller. 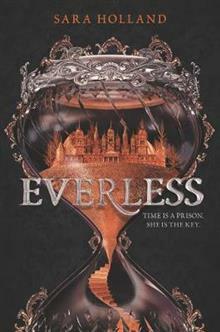 Everless gives new and terrifying meaning to the phrase running out of time. --Stephanie Garber, New York Times bestselling author of Caraval In the kingdom of Sempera, time is currency--extracted from blood, bound to iron, and consumed to add time to one's own lifespan. The rich aristocracy, like the Gerlings, tax the poor to the hilt, extending their own lives by centuries. No one resents the Gerlings more than Jules Ember. A decade ago, she and her father were servants at Everless, the Gerlings' palatial estate, until a fateful accident forced them to flee in the dead of night. When Jules discovers that her father is dying, she knows that she must return to Everless to earn more time for him before she loses him forever. But going back to Everless brings more danger--and temptation--than Jules could have ever imagined. Soon she's caught in a tangle of violent secrets and finds her heart torn between two people she thought she'd never see again. Her decisions have the power to change her fate--and the fate of time itself. Fans of Victoria Aveyard, Kendare Blake, and Stephanie Garber will devour this lush novel's breathtaking action, incredible romance, and dangerous secrets. Sara Holland grew up between small-town Minnesota and the countless fictional worlds of books. She graduated from Wesleyan University and worked in a tea shop, a dentist's office, and a state capitol building before heading to New York to work in publishing. These days, she can be found exploring the city's bookstores or finding new ways to put caffeine in her bloodstream. Everless is her debut novel and is followed by Evermore. Visit her online at www.sarahollandwrites.com.